13 Months of Sunshine is Ethiopia’s tourism catchphrase. It may seem as if it only means ‘alot of sunshine’, but Ethiopia actually has its own ancient calendar with 13 months. The Ethiopian calendar is influenced by the Ethiopian Orthodox Church, which follows its ancient rules and beliefs. The Ethiopian calendar has 13 months, 12 months of 30 days each and one month at the end of the year of 5 or 6 days, depending whether it is a leap year or not. The year starts on September 11 in the Gregorian (normal?!) calendar. The Ethiopian Calendar is seven years, nine months and some days behind ours. In the Ethiopian calendar, today is the 14th day of the 11th month in the year 2004. With all that being said… I have been in Ethiopia for 13 months! 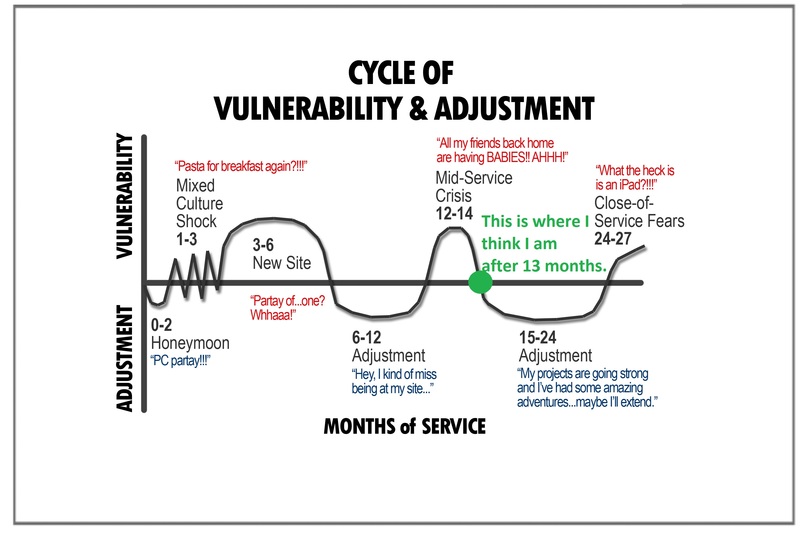 Peace Corps world-wide has a diagram of the typical “Volunteer Cycle of Vulnerability and Adjustment”. The chart shows the emotional rollercoaster that a Peace Corps Volunteer (PCV) rides throughout their service. The top portion shows when the PCV is vulnerable to culture shock, homesickness, loneliness, frustration with lack of ‘work’ and so on. The bottom part of the diagram shows when the Volunteer is adjusting to the PC lifestyle, integrating into the community, finding productivity in work and life and generally enjoying the experience. It has been nearly spot on for me, as well as many of my PCV friends here in Ethiopia. Starting in May, I found myself in the “Mid-Service Crisis”. Work at my site was going ok, but I was REALLY missing home. I missed my sister’s graduation, and couldn’t even skype with her due to an 24 hr power outage. My cousin got married and I wasn’t there to share her special day. I was thinking that maybe I could be doing something more productive at home. Plus, it was summertime back home… swimming, ball games, BBQs with friends and family. Being here was depressing. And it didn’t help that many of the Volunteers around me were feeling the same way. When we got together it was one huge negative vent session. Flash forward to today: I’m coming out of the slump and am adjusting again. Currently, I am in the town of Assela, where I did my Pre-Service Training. This time, however, I am a trainer instead of a trainee. 70 new Trainees came to country the first week of June and since the Education Program is new to PC/Ethiopia, the program manager asked me and some other Education PCVs to help. It’s been a great experience so far. They’ve helped me to realize that what I am doing IS productive and important, and that I AM strong for being able to stick it out to this point. They are all so interested and amazed when I share personal experiences of work and community integration. Their energy and enthusiasm has rubbed off on me. When they ask how long I have been here, I say a little over a year, and they say “Wow!”. I’m more than halfway through my service! I’m ready to take on year two! This page has no official affiliation with the Peace Corps or its staff. Furthermore, the contents of this page does not necessarily reflect any position of the U.S. Government or the Peace Corps. Year Two: You Can Help!